Space Duel is an arcade game released in 1980 by Atari. 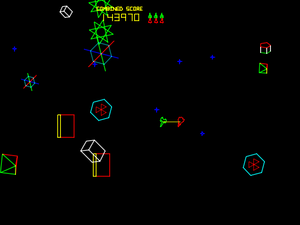 This is a direct descendant of the original Asteroids and Asteroids Deluxe, with asteroids replaced by colorful geometric shapes like cubes, diamonds, and spinning pinwheels. When Asteroids Deluxe did not sell well, this game was taken off the shelf and released to moderate success. Space Duel is the first and only multi-player interactive vector game by Atari. Space Duel was unique for offering players a number of different options for playing. One player could play traditionally as a solo ship, or he could chose to double his fire power by controlling two ships that were tethered together. Two players could play simultaneous, playing competitively by manning their own ship, or by cooperating in the tethered mode. When two ships are tethered, thrusting must be done in cooperation, or one ship's momentum will throw off both ships' positions wildly. Each ship contains a limited amount of Shield power as well. 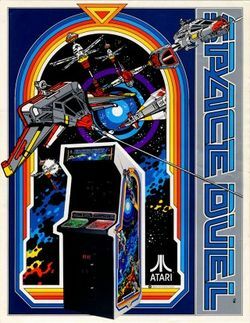 Space Duel did better for Atari than Asteroid Deluxe had been doing, but it was never chosen as a candidate for home conversion. Partly for the same reason that Tempest was never converted until gaming systems had much better resolution, and partly because many of the features it presented, like shields and cooperative play were already features in some of the home conversions of Asteroids. Your ship begins in some location near the middle of the screen (but never quite center). Space objects and mines will appear from the edges of the screen. Any object (including your ship) that passes across one edge of the screen will reappear on the opposite side. You must destroy every object in the stage in order to advance to the next stage. Shooting a large object will break it into two medium objects, and shooting a medium object will split it into two small objects. Space debris can be shot as well, but the more that you shoot it, the more aggressive they become. Saucers and Satellites appear on the screen from time to time, with increasing frequency. They fire shots around the screen, some of which are aimed at you and the rest of which are aimed at other objects. Sometimes, two saucers will appear and fire shots back and forth at each other, increasing the distance between them gradually so that you get caught in the crossfire. When every object in the space is destroyed, you will enter a brief bonus round. In this bonus round, stars and fuzzballs will attack your ship. Whether you survive and destroy them all, or get killed during this time, the next stage will start immediately after. Rotate (Left and Right): As indicated, these buttons will turn the nozzle of your Ship left (counter-clockwise) or right (clockwise). These are important buttons to master in assuring accuracy of your Missile file. Thrust: This button will move your Ship forward in the direction that your nozzle is pointing. It is important to understand intuitively how Thrust will affect your movement. This becomes even more complicated when two ships are tethered. Fire Button: Both players can fire a combined eight stray Missiles before you run out of fire. When one of those Missiles hits an object or clears the screen, you get additional fire-power. As a general strategy, never be without fire-power. Shield: Pressing this button will erect a shield around your ship. The shield will protect your ship from any collision or enemy bullet. If the ship is engaged during a collision, the momentum of the object that hit you will transfer to you and vice versa. If you are playing a one player game with two tethered ships, both ships will raise a shield simultaneously. Use of shields is limited (the shield fades as it drains) and can not be restored by any means until you lose one life. Start: Push this button after you have inserted money. Push it again after the game you would like to begin has been chosen with the Select button. Select: After starting a game with the Start button, press the Select button to cycle through the available game modes. If only enough money for a one-player game is deposited, you can choose between a single ship or a tethered dual ship game. If more money is deposited, you may also choose between a two player separated ship game, or a two player tethered ship game. These are the ships that are under your control. Player one is in control of the red ship, while player two controls the green ship. The only exception to this is in a one player tethered ship game where player one can control both ships. However, even in that circumstance, player one may only activate the thrusters of the red ship, making control very difficult in exchange for the enhanced fire power. You can rotate and thrust in any direction. There is a certain amount of "friction" in this game that will eventually slow your ship down after thrusting, though at an extremely slow rate. Any collision with an object or enemy bullet is harmful to the ship. In a tethered game, the ships can withstand two collisions. The first collision will weaken one of the ships. Weakened ships have limited firing capabilities. The second collision will destroy whichever ship was hit, and the fire from one ship will travel down the tether until it hits the other ship. When this occurs, you have a limited amount of time to continue firing at the objects until the remaining ship is ultimately destroyed. These are the objects that you must clear out from space in order to advance to the next stage. All objects start out in their biggest form. Shooting them one breaks them up into two medium sized objects. Shooting the medium sized objects will break them up into two small sized objects. Small sized objects tend to move the fastest, although any object can be made to move at any speed if collided into with shields engaged. Although an object will start out as a particular shape, it won't necessarily break apart into the same shape except on theme stages. New objects are introduced on stage 1, 2, 4, 7, 10, 13, and 16. All objects behave the same way. If you die during a regular stage, all of the objects will be cleared from the screen and reintroduced when your ship returns. Mines are indicated by the little plus shapes that float around the screen. The first stage contains one piece, and another pieces is added every stage up to a maximum of five. Mines generally float in a single direction, however they can be made more aggressive by shooting at them. Shooting them makes them change color. When they turn white, one more shot will "remove" them from the screen. However, they will instantly return, with a greater ability to track down the position of your ship. The best advice is to avoid them entirely. These objects appear periodically throughout the game. Saucers and satellites will occur with greater frequency according to the following criteria; The longer amount of time spent on each stage, the fewer number of objects remaining on the stage, and the higher number of stages completed. These objects come out and spread shots in every direction. They target the ship and the objects. As the difficulty of the game increases, the shots will have a greater degree of accuracy, and they are aimed at the ship more than the rocks. Occasionally, a green saucer and red saucer will appear simultaneously. They will move across the screen horizontally together, at a certain distance from each other. They will fire bullets back and forth at each other, and increase the distance from one another as time goes by. Stars and Fuzzballs primarily appear at the end of each round during a bonus round, but they can occasionally appear during a normal round. Stars travel in a straight line from one edge of the screen to the other. When they pass beyond the opposite edge of the screen, they become fuzzballs. Fuzzballs start out flying in a general direction. Over time, their ability to turn and reorient themselves in your direction increases. It starts out slowly, but eventually, they will be able to curve around and hit you pretty accurately. Destroy them before they become too deadly. If you die during a bonus round, the objects will clear the screen, and you will start again on the next stage. This page was last edited on 20 June 2018, at 00:11.